Today Rose is a well-known speaker, a frequent visiting scholar at Stanford University’s Hoover Institution, a faculty member of the Global Citizenship Program at the Salzburg Global Seminar, and the author of Freedom and Restraint in the Lives of American Teachers. She is also currently working on a book titled Living the Life of Anne Frank: A Childhood in Hiding. 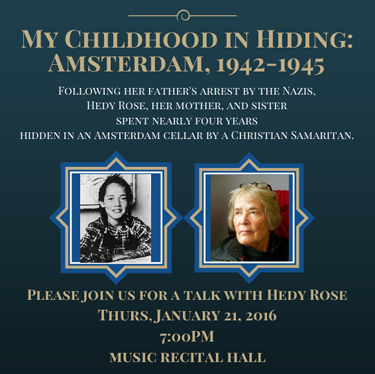 On Thursday, January 21, Rose will give a free public talk at the Music Center Recital Hall on the UC Santa Cruz campus, beginning at 7 p.m.
Seventy-five per cent of The Netherlands’ Jewish population were killed during the Nazi occupation. Of the 140,000 Jews who lived there before 1940, only 30,000 survived the war--the highest death toll of any western European country. Rose eventually came to the United States in 1947. She attended the University of Rochester and received a bachelor’s degree from Cornell University, a master’s degree from Smith College, and a doctoral degree from the University of Massachusetts. She has lectured in the U.S. and abroad, including Austria, Germany, Ireland, Portugal, and in the Netherlands on her personal experiences in an effort to bring history alive, and to help people see the relevance of her story to the world today. 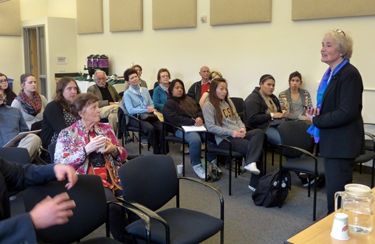 Rose’s appearance on campus was arranged by Cowell Provost and professor of psychology Faye Crosby. This event is sponsored by Cowell College, The Neufeld-Levin Endowed Chair in Holocaust Studies, The Center for Jewish Studies, Stevenson College, Oakes College, and the Psychology Department. For more information, contact Beverly Iniguez: biniguez@ucsc.edu.